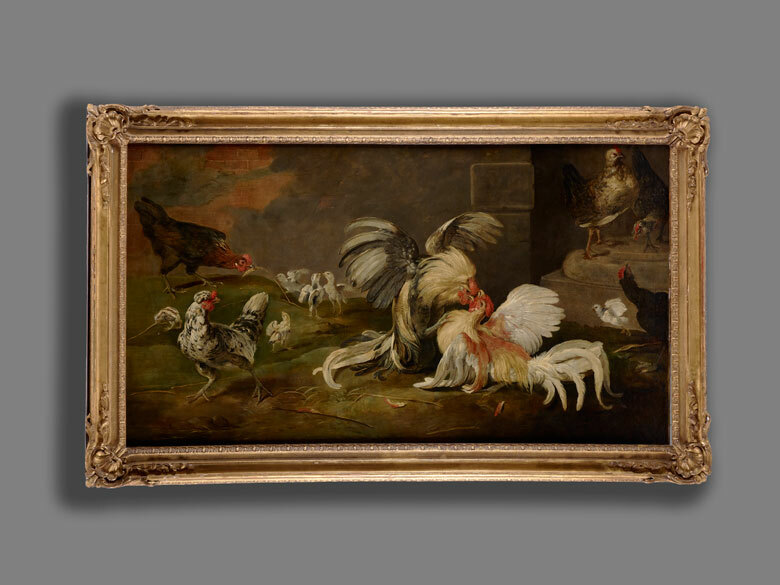 Lot 478 / Frans Snyders, 1579 Antwerpen – 1657 ebenda, zug. HAHNENKAMPF IM GEFLÜGELHOF Öl auf Leinwand. Beigegeben Bericht einer Materialanalyse von Andrés Sánchez Ledesma und María Jesus Gómez García, datiert 7. Oktober 2008, Madrid. Der Hauptgegenstand des Gemäldes sind zwei gegeneinander kämpfende Hähne, mit aufgestellten Flügeln und erregt gespreiztem Gefieder, diese in der Beleuchtung hervorgehoben. Links weitere Hennen mit ihren Küken, die die Szenerie bereichern und ebenso in Aufregung wiedergegeben sind. 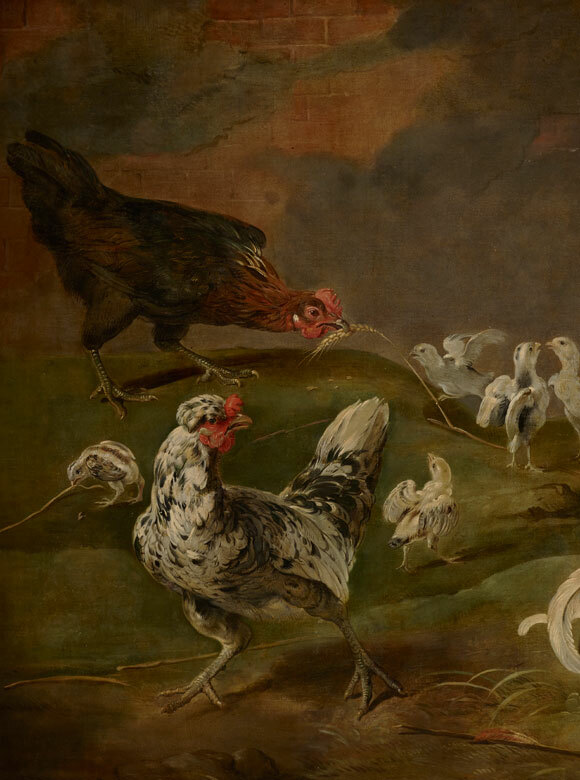 Die Küken teilweise hochstehend, lediglich ein Huhn mit Kornähre im Schnabel. Rechts im Bild zwei eher teilahmslose Hühner auf einer Steinbasis. Accompanied by a material analysis report by Andrés Sánchez Ledesma and María Jesus Gómez García, dated 7 October 2008, Madrid. 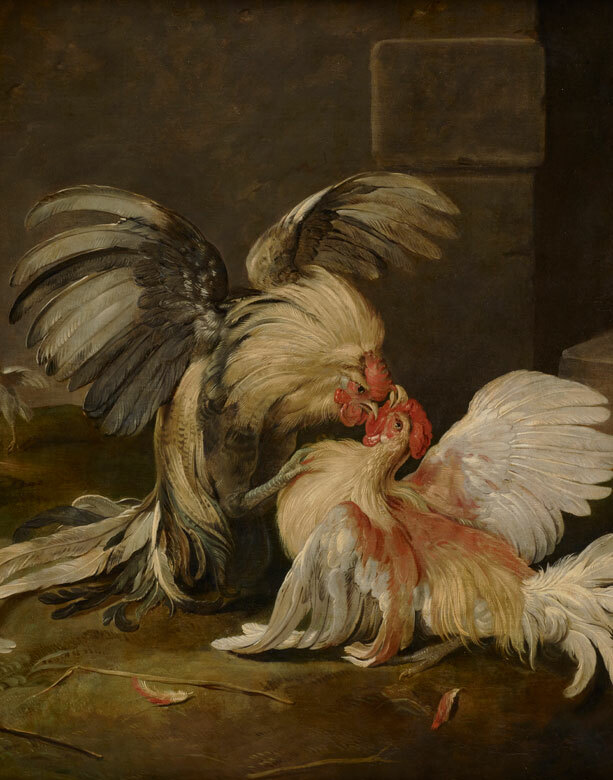 Snyders painted the subject of a cockfight several times. Apart from works that were sold at prestigious auctions in the art trade, a painting held at the Staatliche Museen zu Berlin should be mentioned for comparison here (ca. 1625, inventory no. 878). 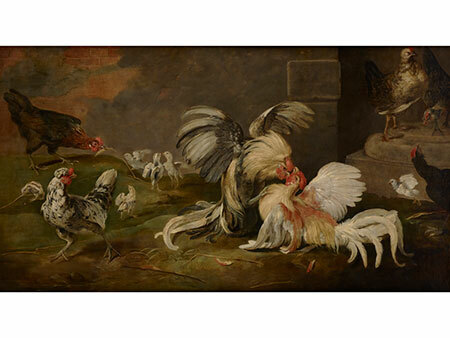 A further painting is held in Bourg-en-Bresse at the Musée de Brou and one at the Prado Museum in Madrid (no. 770), which is a copy of a painting held at the Royal Museum of Fine Arts in Antwerp and is considered a replica by the artist himself. 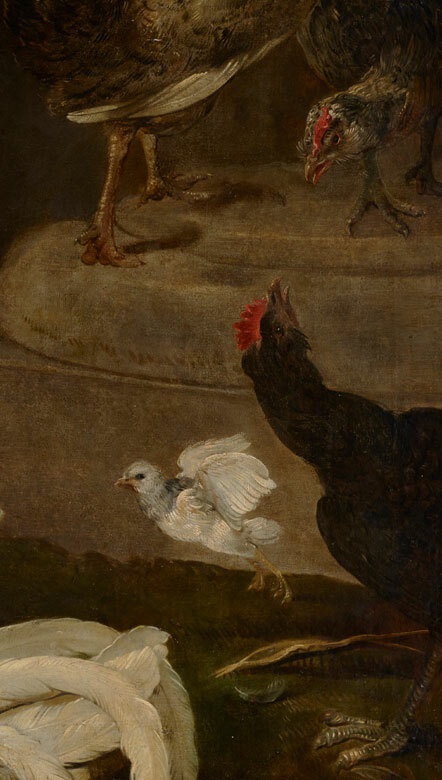 The base of the column on the right can also be found in the cockfight painting held in Philadelphia which dates to the 1630s, just like the Berlin version. Snyders had already painted this subject in 1630, inspired by The Ornithology by Ulisse Aldrovandi (1522 – 1605), which Rubens (1577 – 1640) had procured for him.